DO YOU FEEL LIKE SAILING IN IBIZA? Yes, I feel like sailing! ¡Hi sailors! My name is "The King of Cool" and I´m a sailboat of the family Jeanneau Sun Odyssey 509. I love sailing. I live in Ibiza and I´m anchored in the port of San Antonio de Portmany. I will show you the most idyllic coves to bathe, spectacular sunsets and the best places to anchor. In addition to its spectacular landscapes, crystal clear waters, white sandy beaches, good energy and a thousand other reasons, sail around Ibiza and Formentera from a nautical point of view, has a great advantage, which is that these islands are the perfect size to roam around in a week. Also, if the weather does not accompany, we will always be close to the opposite side of the island where we can take shelter. The first thing you should do is to hire me. Well, to me or any of my friends. Rent a boat in Ibiza	is very easy, fast and secure with Yanpy. Did you already rent it? Great! So, cast off and hoist the sails our boat trip has just started! I am a quiet boat. I want you to enjoy a peaceful sailing. I like sailing the west coast of Ibiza, from San Antonio to Es Vedra. This coast is sheltered from the prevailing winds from the east. The south coast of Ibiza presents similar conditions. Formentera is a paradise island for sailing. Its waters are clear and calm and the wind is perfect for sailing. DAY 1: From San Antonio to Cala Bassa. Our trip will departure at my home. Port of San Antonio de Pormany. Although sailing south, course to Formentera, we will start sailing course NW and NE direction Cala Salada and Cala Saladeta. You shouldn´t loose it. They are the most beautiful coves in Ibiza to me. Perfect for a leisure swimming or snorkel in its crystal turquoise waters. Suggestion: The hippies make spactacular mojitos. Even they can bring them to the boat in a paddlesurf. After that, we head to Cala Bassa where we will anchor for our first night. Another beautiful cove surrounded by a pine forest. Pure Mediterranean. There are several restaurants and Cala Bassa Beach Club (CBBC) will play the perfect soundtrack to our first sunset together. Alternative: Certainly the sunset is more spectacular in Cala Conta (or Cala Compte). The sun will set on a sea dotted with small islands. 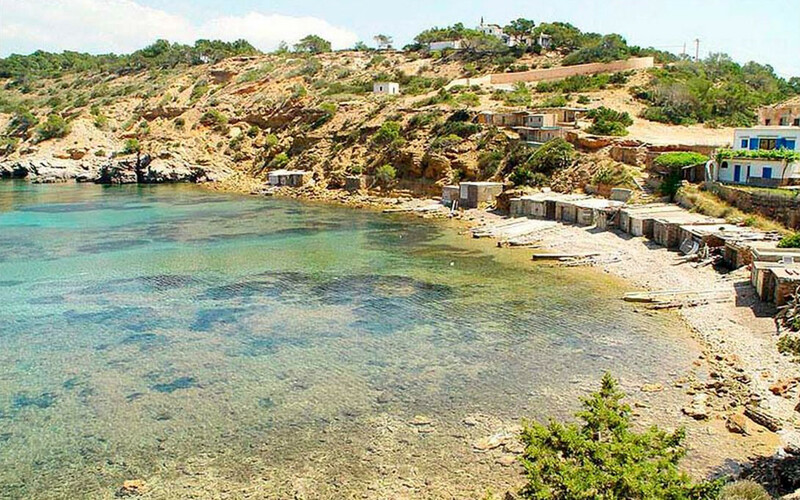 However, this cove is more exposed and offers less shelter to Cala Bassa in order to spend a quiet night. DO YOU FEEL LIKE SAILING AROUND IBIZA? DIA 2: From Cala Bassa to Cala Porroig. Good morning sailors! It´s time to sail! 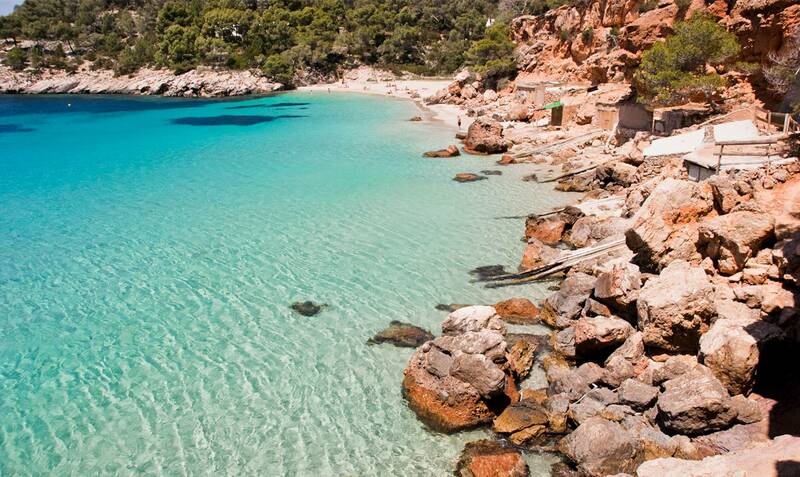 Today, our destination will be one of the best kept secrets of the island: Cala Porroig. ne of my favorite spots in Ibiza. A beautiful cove hidden tourists. Its fishermen's huts make it very lovely. It is also a good refuge for boats as it is well protected from the sea. We will enjoy a calmed night after a tasty seafood dinner. But before that, don´t forget the journey. 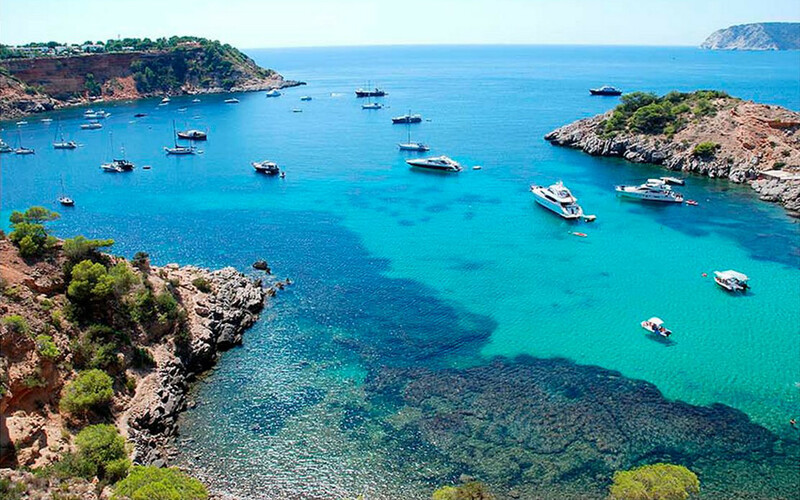 To rent a boat in Ibiza is not just anchor and drink mojitos. Today we are going to visit some of the most famous beaches of the island of Ibiza. Cala Conta, Cala Tarida or Cala Vedella are mandatory stops on our route. Also we will pass by Cala D`Hort and the enigmatic island of Es Vedra, but we will keep this spot for the return trip. Alternative: Just in case your bodies ask you something stronger, take it easy! We are in Ibiza! Anchor’s aweigh! We move to Cala Jondal. It is close to Cala Porroig, even if you fancy a walk, you can easily walk from Porroig. There you will find some of the locals with best vibes of Ibiza. Blue Marlin will let you enjoy a mojito on a white bed on the beach, live music and a parade of beautiful people. DIA 3: From Cala Porroig to Cala Saona. You have rented a boat in Ibiza so let´s sail. Today we have one of the longest sailing journeys . We leave Cala Porroig heading SE direction to Formentera!. Our first stop will be Espalmador island. This island is part of the Ses Salines Natural Park and is one of the most impressive landscapes of Formentera. Since we're here, you have a must, a classic of the island, have a mud bath and give a little envy in your social networks, like, “Look, I'm in Formenteraaaaa”. Take advantage because this will be one of the few times where being fully covered of clay will be very cool! Returning to sail! I love to feel the wind in my sails. Hey, but before boarding do not forget to clean all that mud! We will sail along the west coast of Formentera. We will pass by the beach of Ses Illetes, and the only port of the island, La Savina. Today, our destination will be: Cala Saona. Warning, visit this cove in boat can cause serious consequences when you get back to the routine. Cala Saona is beautiful. Crystal clear waters of a color that will not forget. Take a dip, dive. Welcome to Paradise. Get the selfie stick, it's time to finish off your friends in Facebook. Cala Saona is very quiet, so it will be a perfect spot to anchor tonight. It has chiringuitos (bars) and restaurants to eat and have a cocktail. If you fancy stretching your legs you can have a walking tour to the cliffs of Punta Rasa. Want to find a yacht to sail around Ibiza? DIA 4: From Cala Saona to Ses Illetes. From this point we will begin our return trip. But take it easy, this is not over. I have saved the best for last. Today is an easy sailing day. If you have not yet gone crazy and you're still wondering whether to become hippie and stay on the island, today may be the day. 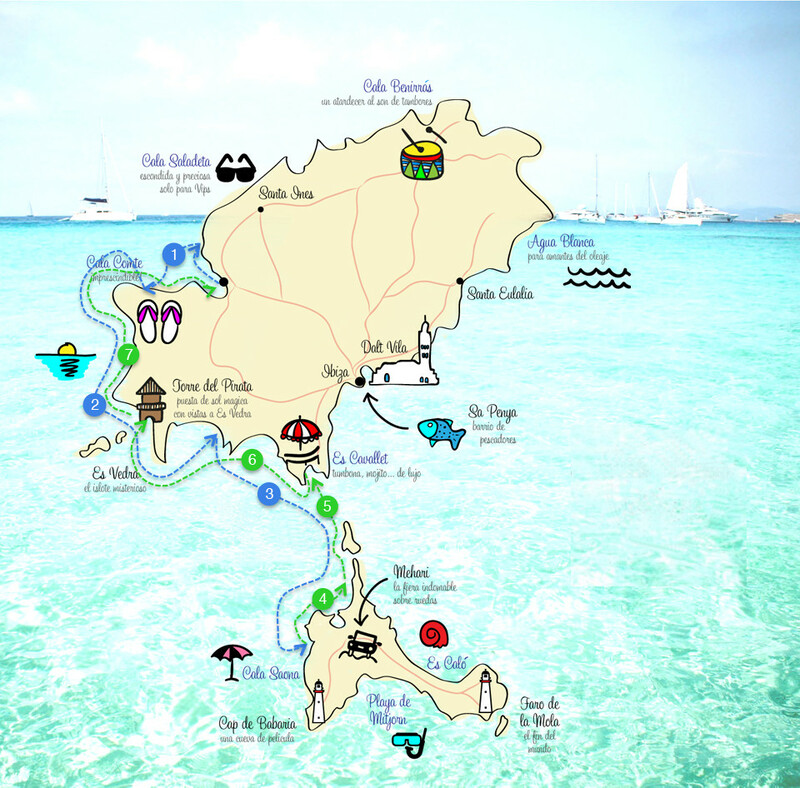 Head your bow course N or NW along the coast to the Spanish Caribbean, Ses Illetes Beach. The crystal clear turquoise waters and fine white sand have given their well-deserved nickname. Relax and enjoy the landscape, water, your friends, your family and your boat trip day. Do you want to discover the island? There is still time. To charter a boat in Ibiza and Formentera does not mean being 24 hours on it. You can rent a motorbike in the marina of La Savina, the most comfortable and popular way to run around the island. Visit their hippy markets, meet his bohemian artists and make a excursion to the lighthouse of La Mola. I´ll be waiting for you for the sunset. Today we will anchor here. DIA 5: From Ses Illetes to Ses Salines. Today we head back NNW to Ibiza. Point to the most famous beach on the island: Ses Salines or Las Salinas. Why is the most famous beach? Because it is full of famous faces. And why is it full of famous faces? Because it is probably one of the most beautiful beaches on the island. It is located in the natural park of Ses Salines, it´s a sandy beach protected by dunes and pine trees. Washed by waters of special purity and transparency through The posidinia prairie, declared World Heritage site. You have hired a sailboat in Ibiza, right?. So, let´s anchor close to a luxury yacht. We will swim with a tattooed soccer player or maybe with a Hollywood actress. Beach of Ses Salines (Ibiza). On the beach we will find all kind of bars. From exclusive, as Malibu, where bottles of champagne and delicious dishes are served to the yachts, to a more relaxed atmosphere as Sa Trinxa where we can dance on the beach with its famous house music. Ses Salines is a quiet and sheltered place to enjoy a pleasant evening by boat. DIA 6: From Ses Salines to Es Vedrá. Today our journey will be short, so we have time enough to stop for a swim in another cove of crystaline waters and also learn some history. After rounding Cape des Falco, we head to Sa Caleta, where you can visit the ruins of the village of the first Phoenician settlement on Ibiza. After a few years they moved and settled in a new part of the island, which now is known as the city of Ibiza (Eivissa). Boat sailing with three relaxed girls on bow. Towards the west, we will reach Cala D'Hort, which will be our anchorage tonight. Cala D'Hort is a white sand beach, fishermen's huts and calm waters where you may eat good fresh fish. It also has a privileged view of the island of Es Vedra, the magic island of Ibiza. It is said that Ibiza is an island full of good vibes and energy. The islet of Es Vedra is a mysterious place, apex of the 'Triangle of Silence' where locals and visitors claim to have seen UFO sightings and other strange phenomena. They can be legends or not, but what is certain is that we will be the protagonists of one of the most spectacular sunsets of the island. A place to recharge your batteries. DIA 7: From Es Vedrá to San Antonio. This is our last day sailing on boat around Ibiza and Formentera, so let´s make the most of it. We will sail along the west coast of Ibiza to the marina of San Antonio. Along the way we can stop in one of the best beaches on the island, such as Cala Compte or Cala Tarida, enjoy the day quietly, having a bath, eat in a snack bar and have a cocktail. This point, I am quite sure that you will need a few days to digest the incredible experience that has been renting a boat to sail around Ibiza and Formentera, so I will not say goodbye to you. I just will say see you soon because I am completely sure that next year you shall visit me again. It has been a pleasure to sail with you all. I´ll be waiting for you. By the way, what is your favorite route? Arriving in Ibiza on 15th oct till 18th. Send me the different boats, sailling route details and cost. We are 2 of us. Hi Prabhu, thanks for your comment. We will send you our best boat rentals offers in Ibiza to your email. Kind regards, The Yanpy team.